For anyone who actually reads my posts, it’s a little obvious I like sniffing out hole-in-the-walls (like here and here). This particular restaurant, though, is more an interesting find. Literally hidden from view at street level. But once you walk nearer and at the very end of a strip mall it’s located in, you realise there’s actually this large house there. Beautifully renovated with trellises, a pond full of large koi and a view of the still developing Eastwood City skyline. 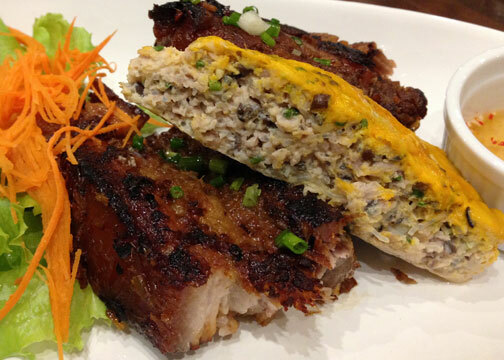 This is the newly opened Bawai’s Vietnamese Kitchen’s Manila branch. I have been wanting to visit Bawai’s in Tagaytay for several years now but plans have never really come to fruition. The call of bulalo or Antonio’s would always prevail. But I’m glad they’re now more accessible for Manila folks. For starters we ordered the goi cuon. 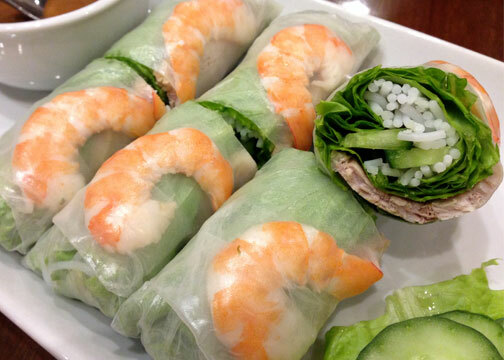 Hefty, fresh spring rolls filled with shrimp, strips of caramelized pork, rice noodles and greens tightly wrapped in rice paper. Extremely fresh flavors. Though after my third roll my mouth was looking for something to break the bland character with, say, a basil or perilla leaf or a stalk of chive or scallion. But don’t get me wrong, it was pretty good. Just lacked a little herbaceousness. I had ordered a bowl of bun bo hue, a rice noodle soup. It’s stock traditionally made with pork feet and lemongrass as primary ingredients. It contained strips of tofu, beef and pork and was topped with coriander, green onions, basil, fried shallots and a drizzle of annatto oil. 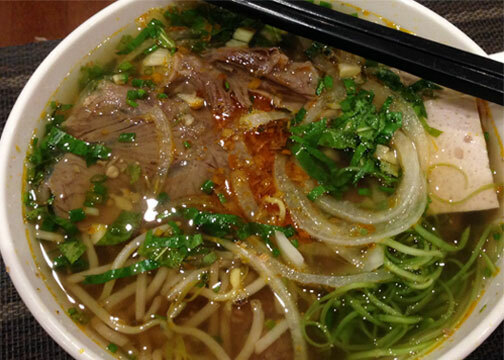 Very complex, layered flavors from the meaty broth and the herbs. I could pickup some acidity from calamansi to balance things out. Meats were soft and the noodles retained a nice firm texture. I wish they just provide more herbs and condiments on the table for extra tweaking for the soups (much like here). Com suong cha was also ordered. A grilled pork belly and egg pie combo platter. The pork was outstanding. Marinated in hoisin and lemongrass and such. Very savoury, with a sticky exterior; but the insides were just fall apart tender layers of fat and meat. I was expecting something sweet but fortunately it was not. The egg pie was more a meat loaf; consisting of ground pork, vermicelli, earthy mushrooms and bound by eggs then steamed. The result is an almost fluffy, truly comforting product. The said combo screams for steamed rice, which is served as a side. 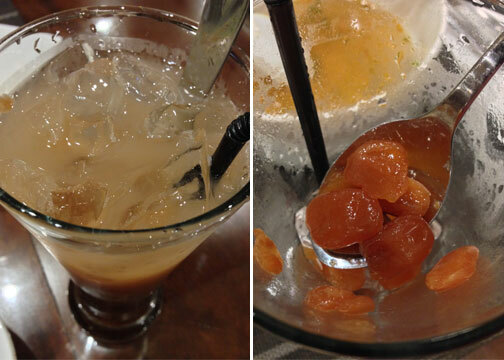 There were some hiccups with service though, as the tamarind iced tea we ordered arrived towards the end of the meal. But it was so good I quickly forgot the slight displeasure. It’s made with a tamarind jam diluted with water. You mix this up with a long spoon and the glass becomes cloudy with the pulp. It’s deliciously tart and sweet and slightly salty at the same time. An acquired taste, but I sort of like these brackish drinks as seen here and here. And I couldn’t get over how you could eat the chewy, nata de coco like seeds after. Dessert took an eternity to arrive as well. 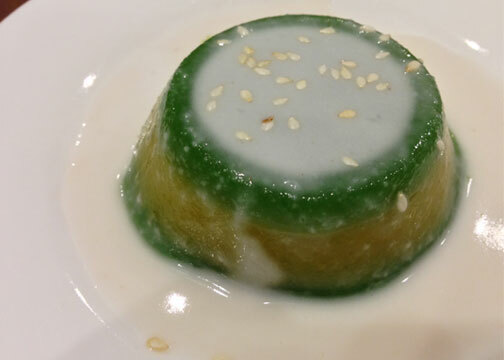 Considering the banh da lon, a rice and mung bean cake, was obviously pre-made and all that was need to do was probably warm it up a few seconds in the microwave. But again, vexation tempered by it’s goodness. An Asian meal calls for an Asian dessert and this was perfect; a sticky and almost chewy rice cake slathered with sweet coconut cream. I would’ve loved to have an actual Trung Nguyen ca phe sua nong with dessert, but given how strong Vietnamese drip coffee is, I guess it was a wise decision to pass this time around. I barely have enough hours of sleep as is. A relatively good meal with all items randomly selected at the very least satisfying. Quite a rarity these days. And even with minor issues with service we walked out of Bawai’s looking forward to try more of the dishes in it’s well curated menu.